When it comes to elegant accommodations, the vacation rentals available in Corolla are truly the creme de la creme. With beautifully landscaped communities, pristine beaches, and all the amenities of a five star resort, Corolla is becoming well-known as the elite retreat of the Outer Banks. Just 30 years ago, this region was virtually undeveloped, and home to just a scattering of beach cottages frequented by a handful of hearty vacationers who craved the isolation of the northern Currituck beaches. Today, however, the area has blossomed into one of the most prestigious vacation rental communities on the East Coast, and more and more vacationers are discovering the quiet and refined allure of Corolla for a family-friendly vacation. If your ideal beach vacation destination is an exclusive collection of homes, attractions, amenities, and all the services and activities to keep a busy family happily occupied both on and off the water, then a stay in Corolla might be just the destination for your crew. Tastefully elegant, accommodating, and filled with fun both within the vacation rental home and out on the town, it's no wonder that this small coastal community is developing a national reputation as one of the Outer Banks' premier beach vacation destinations. Geographically, Corolla is the last town along the northern NC Highway 12, and its town borders end with the two-lane paved road. It is bordered to the east by the Atlantic Ocean and bordered to the west by the Currituck Sound, and while talks are in place to build a bridge that cuts across the sound from the Currituck County mainland, Corolla is currently quite far from the rest of North Carolina and the rest of the Outer Banks. With a location that's a good 15-20 miles away from the central Outer Banks regions, as well as the Wright Memorial Bridge, Corolla takes a little extra time to visit, but frequent vacationers deem the effort well worth it. Up until the 1970s, Corolla was a rarely visited beach town that was well off the beaten path of the rest of the central Outer Banks. Desolate, isolated, and featuring just a handful of weather-worn beach cottages and a few historic Hunt Clubs, Corolla was known as the rustic vacation destination for wealthy vacationers who wanted to get away from it all. Today, the town still serves as an elite beach retreat, but it is certainly no longer rustic or isolated - quite the opposite. The town of Corolla has several chain grocery stores, a number of spas and resorts, restaurants of all varieties, shopping centers, and virtually everything a vacationer could need under the sun to have a fun and fantastic time. The town is home to a number of famous Outer Banks attractions, including two of its most grand sites, the Whalehead in Historic Corolla and the Currituck Beach Lighthouse. The lighthouse is distinctive among the four lighthouses that are scattered throughout the Outer Banks as it features an unpainted red brick exterior and expansive park grounds that include an extensive gift shop, nature trails, and scenic wooded pathways that lead to the rest of Historic Corolla Park. In the summer, visitors can climb to the very top for incredible views of the Corolla landscape, and in the off-season the lighthouse and park's grounds are open to the public to explore, admire, and simply enjoy the salty Currituck Sound beaches. The Whalehead in Historic Corolla is also located within the Historic Corolla Park and is one of the best standing examples of the elite 1920s era "Hunt Clubs" that dotted the northern Outer Banks landscape. The sprawling yellow home is filled with Art Nouveau touches and decor and is an architecture lover's dream for its unique take on the elite coastal hunting lodge. Seasonal tours are available, and the park often hosts summer concerts and special events which are open to the public and are the perfect way to cap off a beach day. While a visitor could certainly enjoy a fun day exploring the local shopping plazas, relaxing at one of the many spas, and enjoying a fantastic meal at one of Corolla's many acclaimed restaurants, the big draw to Corolla vacationers is, naturally, the beach. 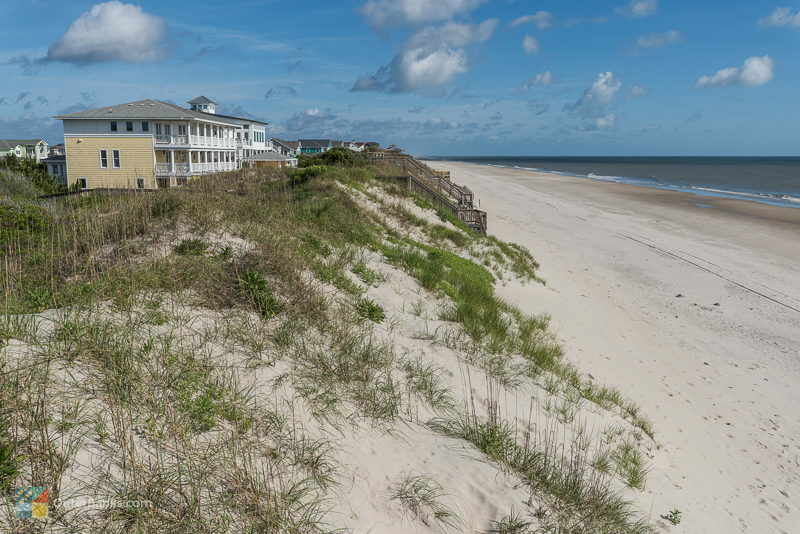 The shoreline in Corolla is nice and wide, with a moderate dune system that is easy to travel across via a series of private and community boardwalks. While the beaches vary, the majority of shorelines feature gradually sloping ocean floors, making it easy for vacationers to swim, body board, surf, and even enjoy a little ocean kayaking at their leisure. 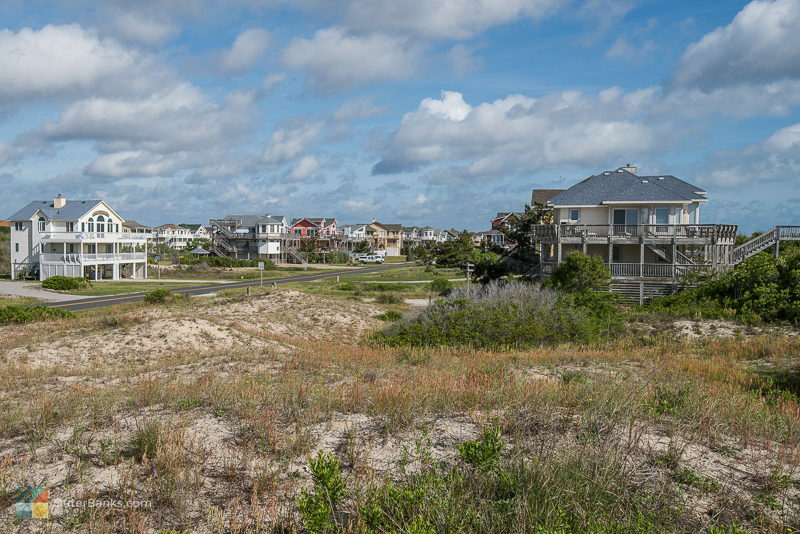 There are limited public beaches in Corolla, and many of the beaches are connected to the town's many subdivision communities. 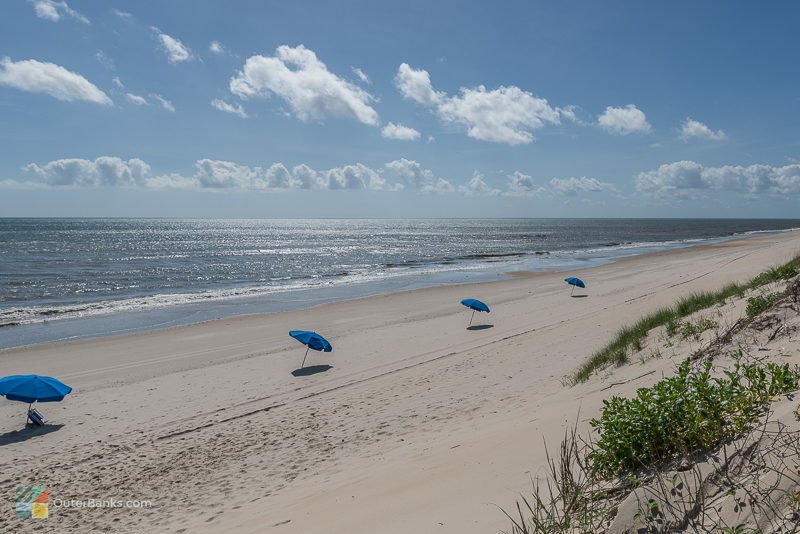 As a result, the majority of the Corolla beaches are unpopulated, frequented only by the vacation renters who are staying nearby, so Corolla visitors will enjoy plenty of room to set up their beach chairs, canopies, umbrellas, and any other equipment they bring along to the seashore. While Corolla has a town center where the majority of the shops, restaurants, and plazas are located, most of Corolla's neighborhoods are comprised solely of vacation rental home communities. 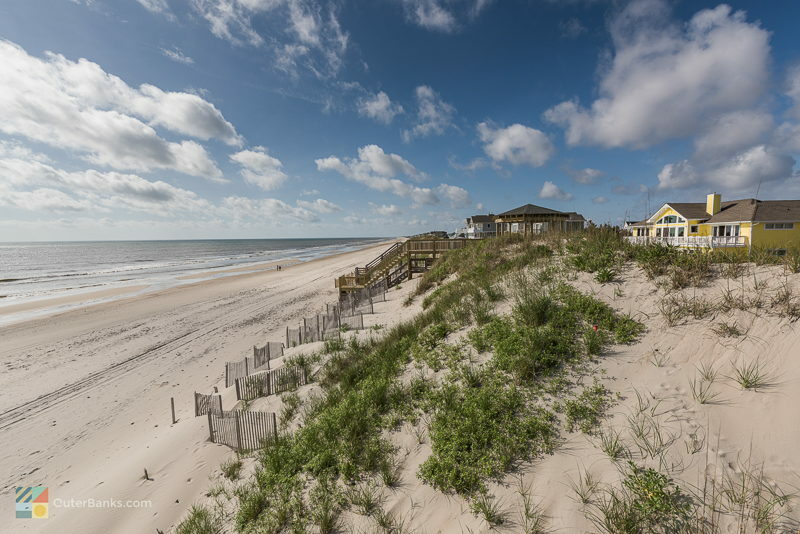 Each "neighborhood" is effectively a part of a larger community, like Pine Island, Whalehead, Currituck Club, Corolla Light, Buck Island, and many other small and large subdivisions dedicated as vacation rental home communities. As a result, vacationers will often find a number of local amenities at their disposal, such as community pools or tennis courts, in addition to quiet neighborhoods that are family-friendly destinations and perfect for evening walks or bike rides through the town. With a lack-back atmosphere that offers a touch of that affluent background Corolla has always been known for, Corolla is essentially an elite vacation destination that is accessible to anyone who loves history, gorgeous beaches, and easy-going days of coastal relaxation. 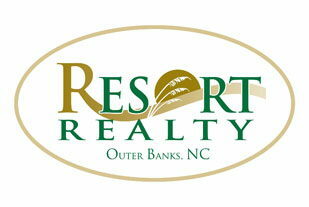 Visitors who want the best selection of the best rental homes on the Outer Banks will appreciate Corolla. The majority of vacation rental homes in this town have been built over the past three decades, and as a result, they feature all the modern amenities and extras that an elite vacationer requires. Smaller vacationing parties will find a handful of lovely condo complexes to choose from, generally located along the soundside or near the center of town. These complexes often offer community pools and hot tubs, as well as private decks and balconies overlooking the scene, and are small enough to serve as a quiet beach retreat for visitors who are looking for a scenic, small getaway. 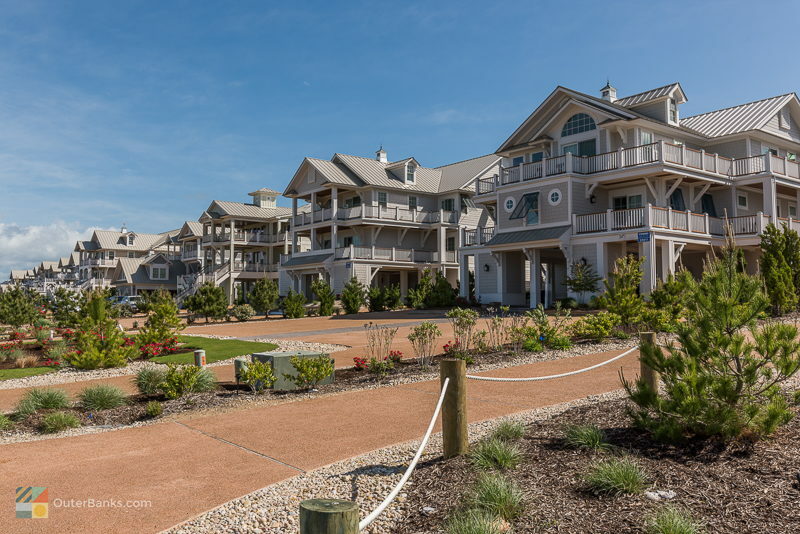 While there is a resort or two, as well as a national hotel chain, the majority of Corolla's accommodations are vacation rental homes, and every single one of these properties is simply fantastic and inviting. There are a limited number of 2-4 bedroom homes available for smaller parties, however most of Corolla's vacation rentals are in the 5-12 bedroom range, and are resort-quality estates with all the bells and whistles to make a vacationer feel like they are staying in an elite resort. Private pools, hot tubs, wireless high speed internet, and game rooms are all common amenities in these sandcastles, and many homes offer these features standard plus much more. Guests can enjoy swim-up bars, putting greens, or poolside Tiki bars, state-of-the-art entertainment systems and theater rooms, and expansive gourmet kitchens with dual appliances and ample room for multiple chefs. This is all in addition to multiple master bedrooms with flat screen TVs, lofts, dens and offices for private retreats, and sprawling great rooms decked out in tasteful but completely coastal decor. Outside, these homes feature multiple levels of decks to take advantage of the ocean, sound or neighborhood views, as well as gorgeous landscaping that is rich in native and southern garden foliage. Because these homes are clustered within small or large subdivisions, there are multiple community boardwalks and paths leading out to the ocean, and plenty of family-friendly neighborhoods that are perfectly safe for playing outside. 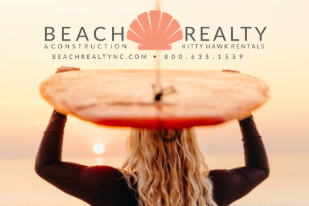 Whether on the ocean or the soundside, many vacationers will find they are just a short stroll away from the local community boardwalk to the beach, and the neighborhoods themselves are clean, pristine, and quiet locales to enjoy a decadent beach vacation. Basically, Outer Banks visitors with a taste for the finer things will fall in love with the ample collection of vacation rentals available in the town of Corolla. Truly representing the best accommodations on the beach, Corolla still maintains its reputation as a destination for vacationers in search of an elite beach retreat. There are many benefits to a Corolla vacation rental, including the exclusivity and premier nature of the homes available. In Corolla, it's easy to find an 8 bedroom home with a private pool and hot tub, and visitors in search of resort-quality accommodations will find it's almost a challenge to narrow down their search to just a small cluster of properties that meet their specific upscale guidelines. Corolla also has a healthy sample of all things Outer Banks, from scenic historic attractions to fantastic art galleries and shopping. In Corolla, visitors can spend a morning exploring the historic Corolla Schoolhouse, which has been converted into the Corolla Wild Horse Museum and an afternoon enjoying a beach-worthy pedicure and a stop by one of the many shopping plazas to load up on gifts for the folks back home. With pizza joints, fine dining restaurants, and family-friendly sandwich shops, foodies will also find themselves well-represented, as the town has virtually every palette covered with a wide range of dining options. Amidst all the glamour and attractions, one might mistakenly think that the beach is a secondary attraction, but the great thing about Corolla is that it never lost its roots as a perfectly secluded beach town. Visitors still flock here for the miles of quiet shoreline that are always unpopulated, enticing, and feature nothing but wide open beaches to enjoy. Corolla is truly an ideal destination for vacationers who enjoy the finer things but are beach bums at heart, and this tasteful small town features all the amenities a visitor might need for a relaxing, quiet retreat away from the rest of the world. Vacationers who are looking for a quiet rustic 2-3 cottage may have some difficulty in Corolla. The majority of the landscape is dotted with exquisite rental homes, and while there are a handful of smaller homes available for rent, most of the properties are geared towards larger family parties. In addition, Corolla has a unique consideration that is actually somewhat common in the northern Outer Banks region in that it is too busy and developed for some vacationers who want an isolated retreat, and not quite busy enough for vacationers who want plenty of things to do within walking distance. Corolla falls in the middle of these categories, and visitors who are looking for one extreme or the other should check out the southern Outer Banks for quiet destinations, and the central Outer Banks for more developed beach towns. Also, while some central Outer Banks beach towns "stay open" for the majority of the year, with shops, restaurants and attractions that are open to visitors year-round, a number of shops and restaurants in Corolla tend to shut down for the winter season, loosely defined as the week after Thanksgiving until March, so off-season visitors should note that the summertime amenities might not be available in the winter months. Finally, soundside vacation renters should note that they will need to cross the main road that runs through Corolla, NC Highway 12, to access the beach. Generally, this is not an issue and there are a number of crosswalks in the major communities to make the trek easier, however, on busy summer weekends, when a line of vehicles are heading to and from the town, it might take a couple minutes to find a break in the traffic to access the beach. Despite these considerations, Corolla is often a favorite destination among Outer Banks vacationers, and has grown in popularity over the years as more and more visitors discover its quiet beaches that are coupled with top-of-the-line homes and modern amenities. 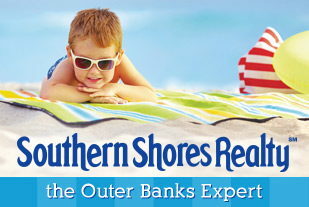 Essentially, visitors on the hunt for the best of the Outer Banks need look no further than Corolla, as the sandcastles that cover the landscape are truly some of the most elite vacation rentals on the Outer Banks. 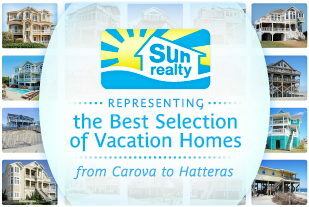 Outer Banks visitors who are planning a wedding should definitely check out the Corolla vacation rental scene. A number of these properties are event-friendly and can accommodate wedding parties of up to 50 people or more. With gorgeous landscapes, ample living areas, and multiple kitchens, wet bars, and deck space to ensure a perfectly accommodating reception or rehearsal dinner, the vacation rentals of Corolla can be an ideal backdrop for an oceanfront or soundfront wedding that all of your guests will treasure. Want an opportunity to see the famed Corolla wild horses? A number of tour groups specialize in providing visitors with 4WD tours of the northern Outer Banks where the wild horses roam. Seasonally available, these tours use individual Jeeps and 4WD tour buses to explore the northern beaches on the "hunt" for the famed wild mustangs. Bring a camera along, and be prepared to be wowed by the incredible wildlife and landscapes that are awaiting visitors just past where the paved road ends. Be sure and keep an eye out on the local Historic Corolla Park events calendar. The park often offers weekly events for vacationers, including weekday outdoor concerts and wine or beer tastings, held right on the park grounds. For a budget-friendly way to enjoy an afternoon or evening off the beach, and at one of Corolla's most scenic locales to boot, a trip to the Historic Corolla Park can be a fun and completely surprising outdoor adventure. Shell hunters should definitely embark on a nice long walk along the Corolla beaches, as the tidal pools and sandbars that pop up along the ocean wash often produce some great, miniature finds. Be on the lookout for wendalls, augers, moon snails, and oyster drillers, which often wash up perfectly intact with large piles of sandy shell pieces and gravel. Don't let the seasonal closures of local shops and restaurants scare you - Corolla is simply enthralling in the wintertime, when the beaches are all but deserted, and the town is a quiet ghost community that is perfectly enjoyable for visitors who want to escape and get away from it all. As an added bonus, the cost of vacation rental homes tend to dip dramatically in the shoulder and off-seasons, so visitors can enjoy the same great homes at a minimal cost. Corolla is a world-class retreat that is sure to appeal to every vacationer with a taste for the finer things in life. This quiet beach town has stayed true to its origins as an elite beach destination, and modern vacationers can choose from hundreds of accommodating properties that are among the very best of the Outer Banks' vacation rental homes. With exquisite homes, gorgeous scenery, and all the hallmarks and amenities of a great beach getaway, Corolla is rapidly becoming a favorite vacation destination for frequent Outer Banks vacationers. Take in an outdoor concert at the Historic Corolla Park or enjoy a sunset from the deck of a fine dining restaurant - in Corolla, every taste is accommodated for, and visitors can enjoy living the good life while delving into the easy-going atmosphere that comes naturally on the Outer Banks. Dubbed a “pirate hideaway," Pamlico Jack’s has fun with the buccaneer theme while still serving up a tasty meal in a beautiful setting. With its location on the Roanoke Sound, it’s pretty much guaranteed that most dinner guests will see a gorgeous sunset. The restaurant serves a full range of appetizers like Atlantic calamari, Caribbean black bean cake and lobster mac ‘n’ cheese. Plus there’s a modest offering of soups and salads (how can you resist the “Walk the plank wedge of lettuce?”)Entrees include fish, chicken, beef and seafood dishes, and even a vegetarian offering. Or if you want something lighter, there are sandwiches, BBQ and burgers. There is also a raw and steamed menu, a children’s menu, specialty drinks and a dessert tray to choose from. The bar offers entertainment in the summer and stays open until about 2 a.m.